You’d be forgiven for thinking your work is done after a customer converts. After all, it means you likely got what you wanted and now have a new customer, right? Not necessarily. Conversion rates don’t always translate to a good customer experience or future sales. In e-commerce, it’s just as important to keep your loyal customers as it is to convert new ones. Luckily, there are a few things you can do to ensure that happens. 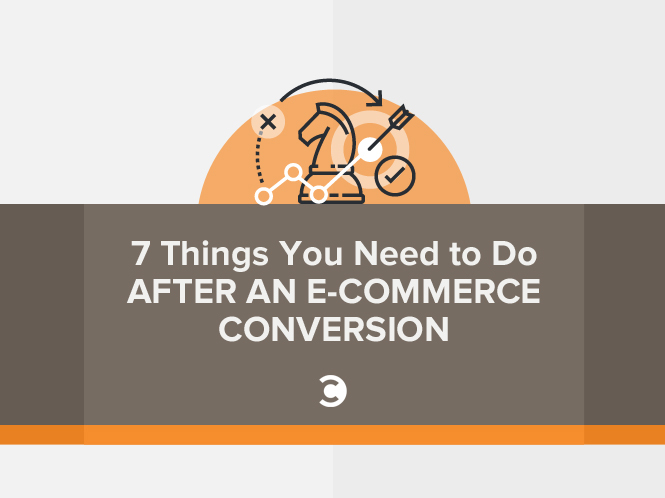 While many online retailers spend a considerable amount of time and money focusing on how they can improve conversion rates, we need to also be thinking about how we can improve the follow-through on those conversions. Here are seven ideas to get you started. Immediately after a sale is the perfect time to make more suggestions. If a customer purchased a certain product or service, you could suggest an upsell or a similar item. More importantly, customers expect to hear from you after a sale. Did their purchase go through? Did they really get the price they were offered? Was a deal honored? Are you preparing their order for shipment? A good e-commerce site always makes sure their customers are well-informed even after taking their money. One popular form of this is the welcome email. After a customer has made a new purchase or subscribed to a newsletter, companies will send out an automated message. An alarming 96 percent of customers say they want a good delivery experience, and it would directly influence repeat sales. Another 66 percent of shoppers say they would choose one retailer over another simply because of better shipping. Shipping updates are part of that experience. As with confirmation emails, customers want to know when their item has shipped and is on its way. There are more reasons for this than just impatience. For instance, if the shipping provider loses the item, they’ll need to file with the shipping company as opposed to your claims department. It’s also not a bad idea to share your shipping procedure with your customers by offering a little more detail. For example, if you are using hot melt adhesive instead of standard shipping tape, point out that part of your process to expectant customers. If a package arrives opened, it’s likely someone tampered with it, because adhesive doesn’t just come undone. This is just another way to support your customers. By sharing your processes and helping them understand the care and attention you put into every aspect of your business, you’re showing your company is trustworthy. Not long after an item has shipped, you’ll want to follow up via email to find out if your customer was satisfied. Send them a survey that allows them to share their experience. Ask about the buying and shipping experience. Ask about the product they purchased. Try to glean everything the customer is willing to share. This can help you further refine your strategies and improve future customers’ experiences. You can also take this opportunity to ask customers to provide a review of the items they bought or share their overall experience with your company. This could mean requesting a review through a platform like Amazon or Yelp, or it could simply mean collecting a personal review for your own website. Just because you have converted someone to a paying customer doesn’t mean they are automatically happy with your brand, service or products. The only way to know for sure is to reach out and ask. Some customers may ignore these prompts completely, but it’s giving them the chance to be heard that counts. This one is particularly important. When a customer has added products to their cart and then left the site, you should have a system in place to reach out. Amazon, for instance, will gently remind customers that an item is still in their cart and then suggest similar products. It’s possible the customer was distracted and left to do something else. It’s also possible they weren’t quite convinced they really wanted the product in their cart. A reminder may be just the push they need to make that purchase. There are many great examples of this practice in action. You’ll notice a lot of these emails mention the products that were abandoned, and some even suggest other products that are cheaper or comparable. Even if you don’t have a customer loyalty program, you can still offer great deals, special offers, and promotions to your regular customers. It’s also a great idea to offer an exclusive discount to paying customers after they make a purchase, especially when it comes to upselling. You can even offer things like free shipping or additional products in return for a sale. According to the most recent research, 71 percent of U.S. internet users’ purchase decisions were influenced by coupons and discounts. By offering them to your customers, you are kickstarting this relationship, encouraging them to make another purchase. It’s no secret that nearly every company or brand has strict limitations on their return policy. Do you stop taking back items after 60 to 90 days? Are there certain items or products you won’t take back? Are all sales final? A full 92 percent of customers will buy from a company again if the return process is easy. After you have a customer, it’s not a bad idea to include a blurb or reach out separately about your returns policy just to make sure everyone understands the stipulations. This will also prevent them from getting angry later when they didn’t know a particular policy was enforced. Do you offer a limited warranty for registered products? Don’t you think your customers would love to know this, especially before something happens? This opens up another opportunity to get in touch post-sale: Encourage your customers to register their new products. This is also where you can suggest FAQs and help, include links to your customer service, explain your return policies, and more. The relationship with your customers does not end after the sale. By reaching out and remaining open, you can ensure that customer is likely to become a regular. They may also recommend you to others. That’s a great business strategy to employ.